Friends, Chocolate Almond Olive Oil Granola is prime breakfast, grazing, and snitching material. Make a batch and hide it from yourself, or better yet—make a batch and hide it from everyone else. The cocoa powder gives it a rich chocolate taste that’s satisfying without being too sweet to enjoy for breakfast with yogurt. Tart dried cherries pair marvelously with the cocoa, roasted almonds add crunch and toastiness, and a pinch of cinnamon provides warmth and all-around irresistibility. For a final bit of flair, I threw in a handful of shredded coconut, which took the Chocolate Almond Olive Oil Granola from “this is seriously yummy” to “CAN’T STOP, WON’T STOP, SEND HELP…but wait until I’m done eating the granola.” You have been warned. To keep the granola relatively healthy, I made it with fruity, heart-healthy olive oil. If you have never tried using olive oil to make granola, you are in for a treat. It creates a light, crispy texture that I love and gives me that “ahh so good for you” feeling with every bite. 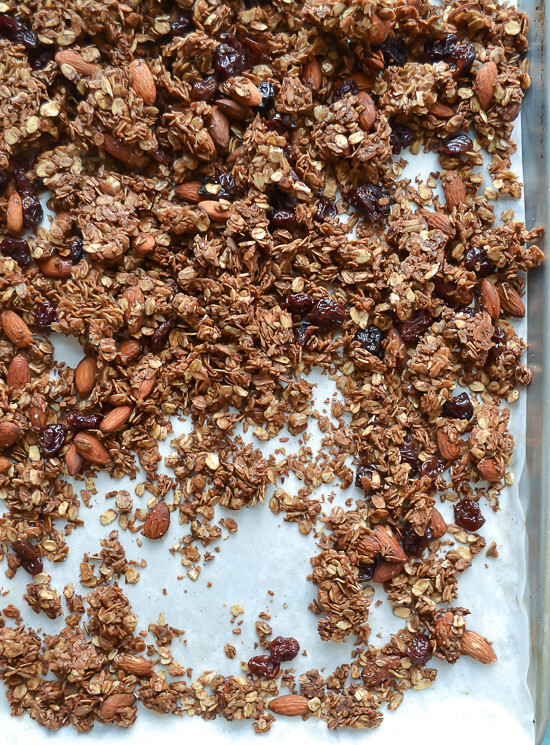 Chocolate Almond Olive Oil Granola: because life is too short to save the chocolate for dessert. I hope you enjoy this wholesome way to add a little extra chocolate to your day. Congrats again Steph, and thanks for letting me guest post for you! Place rack in center upper third of oven and preheat to 300 degrees F. Line a 9×13 inch rimmed baking sheet with parchment paper. Remove from the oven and let cool completely. Stir in dried cherries. Store in an airtight container at room temperature for up to 2 weeks or in the refrigerator for 1 month. What an interesting little granola tray. I think I could get in trouble with this…handfuls and handfuls would just be disappearing. I love this Erin!! Such a great recipe and I will take chocolate for breakfast any day! Yum! Granola is weakness and I would gladly eat the whole tray! Chocolate for brekkie is always legal. Gorgeous Erin!! I wish I had some right now for breakfast instead of my boring hard-boiled egg. Erin, this granola looks AMAZING! It’s been a while since I’ve fashioned up a batch, which has made my breakfast life a little womp womp lately. I need to put some spark in my mornings again with this granola!! Love the way your sneaking chocolate into breakfast, Erin! This granola is amazing!! Now THIS is my kind of granola!!! Good heavens this would make even a non-breakfast eater look forward to that meal. I tried to make some banana bread granola a few days back and it was an epic fail. So tempted to try again with this recipe — it looks crazy delicious! I’m already a big granola fan, but this chocolate addition is making me swoon! I am all about a little chocolate for breakfast, love this granola! Chocolate granola rocks! Great recipe, Erin! Kelsey — Oh, how fun about your sister’s name! It’s a good one. 😉 Thanks so much for stopping by! I loove home made granola! Oh I love granola! It’s hard to find the good stuff here, so homemade is definitely the way to go. Thanks for the yummy recipe! 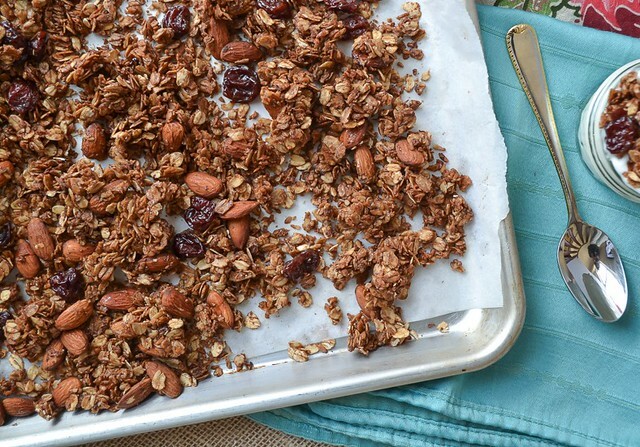 This granola looks so wholesome and delicious, and I’m all for chocolate for breakfast! Ana — Thanks so much for stopping by! The cherries get stirred into the granola once it is fully cooled — sorry that wasn’t clear before! All fixed now. 🙂 Hope you enjoy it! Dominique — Hi there! In answer to your question, from Erin, the creator of the recipe: “I would be very hesitant to cut out the sugar and honey, at least completely. She could try reducing the amount by a few tablespoons, but it forms a part of the sticky liquid that binds the granola. Without it, I think she’d have toasted oat flakes, and it would be hard for the cocoa to stick too.” Hope that helps ya! What is light and fruity extra virgin olive oil? I have extra virgin.. but never heard of “fruity”. Does extra virgin olive oil work? Michelle — Just use a light extra virgin olive oil! 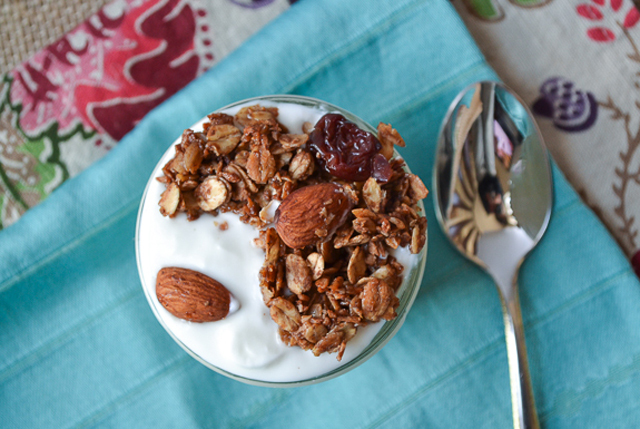 This is my favorite granola recipe and I have tried a lot of different granola! I subbed cacao nibs for the coconut. I make it twice a month. Lindsay — Yum! Love the addition of cacao nibs!